CB201525 shown Note the extreme 50° angle of rotation with solid opposing clamping surfaces! Innovative fixture blocks for jewelers, engravers & stonesetters! Ready to use with thermo-set fixturing media. The cylindrical cross-section allows for 30° rotation to either side for the standard blocks, and up to 50° for the proportionately thicker models, while providing opposing parallel surfaces for solid clamping. With Cylinder Blocks™, almost any point on almost any piece can be positioned at its optimum working angle. Essential for microscope work, but extremely handy any time you need better access, visibility & control. 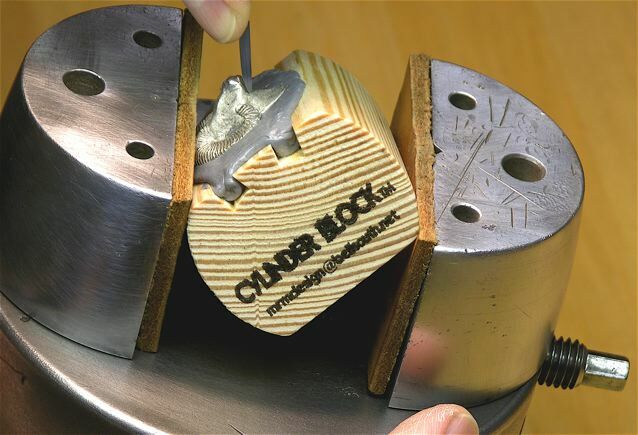 Fully compatible with any fixturing medium, the wooden blocks can also be easily shaped to custom-fit most any part (i.e. drilling or carving a cavity to accommodate a projection on the back of a part). In response to industry requests, all Cylinder Blocks™ now have Thermo-Grooves™. As you can see in the above photo, these angled grooves are specially designed to accommodate the use of thermo-set plastic fixturing media, such as Jett Sett™, & GRS Thermo-Loc™. The dovetail cross-section takes advantage of the fact that these materials shrink slightly as they cool, tightly gripping the block and solidly anchoring your work piece.